Twenty-one members of the Kansas City chapter, Delta Sigma Delta, the members being students at the Kansas City dental college, gave a banquet last night to Dr. Warren Gill, a faculty member, at the Sexton hotel. In a short time Dr. Gill will leave for California to begin practice with the Chicago White Sox, in which team he is a candidate for first baseman. Dr. Gill is well known in baseball. He was first baseman for Minneapolis last season. 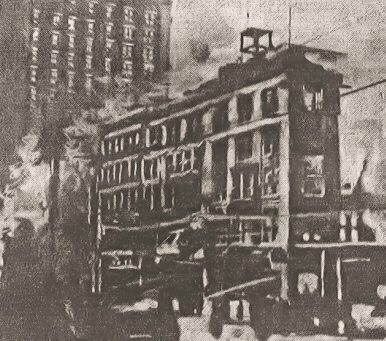 Presence of mind displayed by Mrs. Wilhelmina Kimberling probably saved her life late yesterday afternoon, when a gasoline blow-pipe exploded in the office of Dr. Frank H. Newton, a dentist at 520 Minnesota avenue, Kansas City, Kas., throwing burning gasoline over her clothing and that of Dr. Newton. She ran screaming for aid from the little work room, where the explosion occurred, to the outer office, where she laid down on the heavy floor rug and folded it about her in an effort to check the flames. Dr. Newton, whose clothing was also afire, raised a window and shouted for help, in the meantime smothering the fire in his clothes. Leslie Channel, a young man who lives in Quindaro, Kas., and his father Samuel Channel, heard the cries and ran upstairs. Mrs. Kimberling's clothing was still burning when they reached her, and Leslie Channel threw his overcoat about her. Dr. Newton, who sleeps in apartments adjoining his offices, carried a heavy comfort from his bed and folded it about her. The folds of the overcoat and comfort smothered the flames, but not until she had been seriously burned. Drs. J. A. Fulton, W. H. McLeod, E. R. Tenney and J. S. Kline reached the scene of the accident soon afterward. The woman was given emergency treatment, and taken to Bethany hospital where it was said last night her condition was critical. She received severe burns on the arms, chest and legs. Her face was also burned, but the attending physicians said the burns there were superficial. Both of Dr. Newton's hands were burned, and he also suffered a severe burn on the left leg. He was attended by Dr. Kline. Mrs. Kimberling for several months has worked in the doctor's office. Her mother lives in Illinois. She has one daughter, Hazel, 5 years old, who lives with friends in Kansas City, Mo. Mrs. Kimberling is 23 years old and lived in apartments in the same building in which the accident occurred. The gasoline blowpipe, which caused the accident, is used by dentists to melt the gold used in fillings and crowns. Dr. Newton said last night he did not know what caused the explosion, but supposed it was due to a defective connection. The dentist's blowpipe is similar to that used by plumbers for melting solder. Dr. Dayton Dunbar Campbell of the faculty of the Kansas City Dental college was the guest of honor last night at a banquet at the Hotel Baltimore given by the members of the Delta Sigma Delta fraternity of the college, and as a fitting climax to the event Dr. Campbell gave a little talk on "Dental Don'ts." Here are some of Dr. Campbell's "dont's" -- "Don't brag about your practice or the size of your fees. Don't gossip with your patients. Don't do any quack advertising. Don't encourage familiarity on the part of your women patients. Don't knock your brother practitioners. Don't talk shop at social gatherings. Don't be untidy." The banquet was tendered by Dr. Campbell as a token of the esteem in which he is held by the fraternity members. Covers were laid for eighteen. Heart disease made acute by worry over the janitor service in an apartment house on West Thirty-fourth street, for which he was the agent, is said to have caused the death of Dr. Ammon Kuns, a real estate man of 805 East Fourteenth street, who expired suddenly in front of the apartments at 6 o'clock last night. Dr. Kuns, who seven years ago retired from dentistry in order to handle realty, had been suffering from pulmonary trouble for more than a year. He left his home yesterday morning in good spirit and apparently in excellent health, remarking to his wife that he would go to the flat on Thirty-fourth street before supper and see about hiring a new janitor. "Everyone leaves the rooms in a worse condition than the last," he said. "It is about the only worry I have." Mrs. Kuns said last night that she had learned that conditions at the apartments were not even as good as her husband had expected when he arrived there. She believed that his dismay at finding that some of his instructions had been neglected caused the undue excitement that hastened his end. Mr. Kuns was 57 years old. He was born in Illinois, went to Jewell City, Kas., 27 years ago to practice dentistry, and lived there continuously up to seven years ago when he moved to Los Angeles, Cal. Four years ago he came to Kansas City. Besides the widow, he is survived by four daughters, Mrs. Stella Mayhue, San Francisco; Mrs. Theodore Conley, Los Angeles; Mrs. O. E. White, of Jewell City, and Miss Helen, living at the home. Kuns was a member of the Odd Fellows, Masonic and Woodmen of the World, local lodges. Funeral arrangements have not been made. Deputy Coroner Harry Czarlinsky ordered the body sent to the Wagner undertaking rooms. A romance that commenced in the visits of the ice man this summer to the home of G. M. Risley, a dentist at 2628 Myrtle avenue, ended yesterday when Ruth Risley, the 17-year-old daughter, eloped with Otis L. Pemberton, 23 years old. The young couple went to Kansas City, Kas., but on account of the youthful appearance of the girl, the marriage license was refused. When Dr. Risley heard the news and located his daughter, he promptly sent her to Butler, Mo., to join her mother. "It won't do any good," the girl said firmly when she was placed aboard the train. "It won't be much more than six months until I'm 18 and then I can do as I please." It wasn't exactly love at first sight, for the young man had tramped through the kitchen several times before the daughter of the household realized that he was good looking and that he was more cheerful than the average ice man who grumbled when he had to carry ice to the far end of the ho use. The ice man's visits were sometimes prolonged and in time the young folk began to converse in a friendly manner. Miss Risley discovered to her satisfaction that the young man talked in a pleasant manner, and was in no way inferior to her classmates at the Manual Training High School. Evening calls followed and the family began to notice that the well dressed young man who was so attentive bore a striking resemblance to the ice man who came every morning. When the parental storm broke, plans for an elopement were made. "We can get married in Kansas," was Pemberton's comforting assurance. "Just say that you are 18, and it will be all right." It wasn't so easy when they faced the man in the recorder's office. "Yes, I'm 18," said the girl, falteringly. The man behind the desk grinned in a tantalizing manner and expressed his doubts. Then a lot of questions followed, and in the end Miss Risley admitted she was only near-18. There was nothing to do but return to the Missouri side, which the young couple did. "Perhaps my mother will help us," said the young man, so they went to his home at 2717 East Fifteenth street. A strange man met them at the gate. "I AM A DETECTIVE" -- FOILED! "My name is L. D. Jennings, city detective," explained the stranger. "Sorry that I have to take you to the police station." It didn't do any good to remonstrate and the would-be elopers accompanied the officer to police headquarters, where they were met by Dr. Risley, who wasn't in an altogether amiable frame of mind. "You will join your mother at once," he said when he was told that they had not succeeded in tying the wedding knot. "No more of this foolishness." Carrying a pressure of 250 pounds to the square inch, a vulcanizer gave way in the work room of Dr. A. S. Kaulbach, a dentist, at Twelfth and Main street, yesterday afternoon. The vulcanizer was wrecked, several sections narrowly missing Dr. Kaulbach. He was splattered with debris from the room, and two windows were blown out. W. B. Clark, the crossing policeman, was under the impression that an amateur safe cracker was at work, so loud was the noise of the explosion. When he walked into the Helping Hand institute Saturday afternoon he was leading a bull dog. He was dressed in the latest fashion and his shoes were of patent leather. The clerk thought the visitor was there merely as a spectator and was somewhat astonished when he walked up to the desk, paid his 10 cents for a bed and asked: "Is there any place here that I may keep my dog?" "Well, I guess I'll go back to the Baltimore now. I am on my way from Billings, Mont., to Galveston, Tex., and got broke here. Knowing no one here I could not ask for credit. I was glad to find a place where I could get my board and room. I'll be glad to pay you now for your trouble." "You worked, and worked well, for what you got," he was told. Leading the bull dog the man left the institution yesterday afternoon. The bank informed him that it was too late for him to get his money, but that he could have it this morning. The telegram gave him entree into the Baltimore again, however, and he remained there last night This morning the man, who is a Billings, Mon., dentist, will leave for Galveston. Joseph Parker, 45 years old, who lived outside the Argentine city limits, on South First street, died suddenly in the dental chair of Dr. E. W. House, No. 10 Spear avenue, Argentine, at 10 o'clock yesterday forenoon. Heart disease is said to have been the cause. Parker had been ailing several weeks and was under the care of Dr. C. L. Zugg, his family physician. As he had been troubled with several bad teeth, he was advised to have them taken out. Three of the teeth had been removed when suddenly Parker straightened out in the chair. Dr. House at first supposed the patient overcome by the cloroform, but it proved to be a fatal attack. DRUG TOO MUCH FOR HIM. William Miller, a farmer from Stanley, Kas., came to Kansas City yesterday to have a tooth extracted. Before leaving home he said a doctor there gave him several doses of chloral hydreate to deaden the pain. The dentist also used some kind of pain killer, possibly cocaine. The tooth was pulled about 4 o'clock. At 7 o'clock he was in the saloon of Jack Gallagher, 8 East Fourth street, wh en it was noticed that Miller was bleeding at the mouth. He was also delirious from the effects of the double drugging he had received. Miller was taken to the emergency hospital, where Dr. W. A. Shelton and Dr. J. A. Naylor worked him over for three hours before the hemorrhage was stopped. Miller fought until he wore himself out, as he believed the doctors were trying to do him harm. After he revived he told of the drugs which had been given him.